Jennifer D. Bell, 26, pursues mapmaking with a passion. 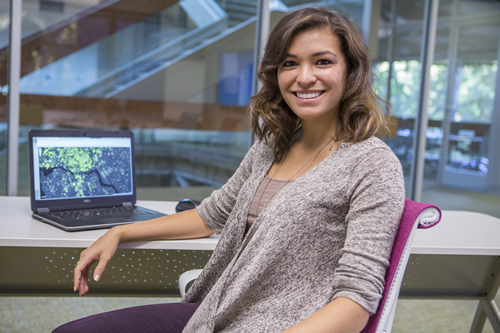 As a cartographic product engineer at Esri, she tests newly developed ArcGIS software and makes maps she hopes will inspire the ArcGIS community to try new tools and techniques. Best of all, Bell gets to use her cartographic, artistic, writing, and research skills to tell stories about the pressing issues of our times. "I love my job creating maps that are meaningful and could possibly bring change," she said. Read the article. Jennifer D. Bell enjoys her work testing software and making maps at Esri. A new feature called Create Story will help you choose the best app to create your latest story map. Create Story is available on the Esri Story Maps website. Learn how to make a map with a glowing double ring effect using smart mapping in ArcGIS Online. Esri's Bern Szukalski and Mark Harrower take you through the steps. Read the tip. Businessman David Hicks commissioned DataStory Consulting to create a story map aimed at explaining what passage of a school bond measure would mean for the schools in Allen, Texas. Read the article. Learn why Hicks uses ArcGIS. When a power outage occurs, GIS and dashboards can give utility managers up-to-the-minute access to real-time, accurate information such as the location of the outages and the number of customers affected. Read the article. Tim Nolan was planning to become a microbiologist until geography intervened. Today he leads a team in Collin County, Texas, that creates innovative apps such as the Election Polling Place mapping app. Read the article. El Niño will pack a punch, bringing much needed rain to many parts of the United States this winter. But with the rain will come flooding. Protect people and property with Esri's new offering, ArcGIS for Flood. Learn more. Interested in creating geo-enabled apps that will help your community or business communicate information or solve problems? 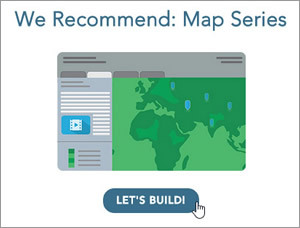 Esri will host the free, online Do-It-Yourself Geo Apps course February 3–March 2, 2016. No coding experience is required. Sign up today. Collector for ArcGIS on Windows 10 is now available at the Windows Store. Now your organization can complete your data collection workflows on any platform, including iOS and Android. Read the blog. Get started. Take a 3D tour of the Star Wars galaxy, as sketched out in ArcMap and visualized in Esri CityEngine. See the location of Tatooine and what Alderaan looked like before and after being struck by the Death Star's superlaser. Read the blog. Take the tour. Planning the rollout of voter apps for the 2016 general election? Esri offers election solutions to governments, including the Election Polling Places, Early Voting, Polling Place Wait Times, Election Results, and my Elected Representative apps. Read the blog. Nathan Shephard from Esri answers 10 questions from Esri software users about how to work with 3D GIS in ArcGIS Pro and ArcGIS for Desktop. Watch the video. The ArcGIS Imagery Book, which Esri will soon publish, features a story map that shows how orthorectification removes distortion from imagery. See a before-and-after image of Oregon's Columbia River Gorge. See the story map. You can use the new Esri new Photo Survey app with a number of GPS-enabled vehicle-mounted cameras to conduct photo surveys of entire neighborhoods or cities. Get started with the app. Read the blog. For the Danes, rainy weather seems to be the new normal. In a new Learn ArcGIS lesson, you will use ModelBuilder to find flood-prone areas and buildings at risk for flood damage in Denmark. Take the lesson. Esri offers ArcGIS for Desktop Virtualization Appliance, an optimized virtualization solution for ArcGIS for Desktop (ArcGIS Pro and ArcMap). Order now. Esri president Jack Dangermond issues a special invitation for you to attend the next Esri User Conference, where you will meet people like you who are passionate about GIS. Watch his video invite. Register for the conference. Get a sneak peek at the new Workforce for ArcGIS app (now in beta!). The app helps organizations better coordinate field work and gives workers the ability to manage their field assignments from a mobile device. Read the blog. Learn more.